Mai name is nawt Lucy! Um duz u want sum rumwiv ur gushifud? Ai fink kitteh wants pie rite? Conga rats on ur taupe spot! Lets have sum aplol pie with whipped cream! And liquid refreshmints of course! Reddi-made pyratt kitteh inna bawks! Gotta hab wun! Wear do Ai order dem frum? And if you order now, you get two for the price of rhum! Wun see-shanty comin’ up, Cattain Blakkface! Weer bownd foar Souf AwStraylya! Adn itz OOOooo, yu kitteh, yu look funneh! All teh human girls, tehy loves yu foar yur munneh! aarrrr that bee a heartee sawng Lungdoc! Dat be a fyne pair o lungs ye haz thar wench! YAAAAAAAY FUR YUR PIE-RAT DAY FRUNT PAYJUR!!!1! Lub ur pye ratt hat, SP! Miow miow miow an a bottlol uv milks. Let teh pie ruts fill theyr tums! Now, where is my parakeet? Here, Tweety. Adn he iz nobodee’s fool! adn pulls up hiz pyrat socks! Coastal folks, go warn yur daughters! 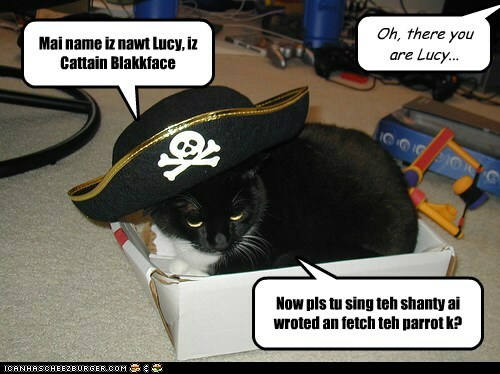 He’z a pirat nao indeed! heers teh burfday fairy to say HAPPEE BURFDAY to phat cat, Petalchrome an evreewun else hoo haz a burfday today! i haz bringd yummy fudjy burfday caeks, rum caeks wif fluffy rum frosting (plz to nom responsibloly), iskreem, pirate party punch, fansee blak pirate hats, an goodie bags filled wif shiny pirate swords, talking toi parrits, tresure chests filld wif tresures, kandee, an temporary pirate tattooz! an a big swish ob teh burfday wand to making all yor burfday wishes come troo! iz also teh burfingday ob Mamagwyn hoo wented ahed ob us to teh bridje last yeer. so i haz bringd brite-colurd baloonz an shiny markers to write messijes to mamagwyn or anywun else yoo wants to remember, to send to teh Meddow. Thank you oh lovely burfday wench! wut? Burfday Fairy nawt hazza wite markur! Ai hoeps yoo am berry happeh in teh meddoe, an getting tu snorglol an cuddlol an snugglol awl teh kittehs an goggies an peeplols yoo want tu. Plz tu gib speshlol hugzs tu mai Dadcat, an mai hart-goggie, Lucy. Plz tu tell dem ai lubs dem an ai miss dem. An ai miss yoo, tuu. Happeh birfingday, deer frend! Buckle yer swashes ai be settin sail across teh ̶c̶a̶r̶p̶e̶t̶ seven seas! Yu’ll sai no finer Kitteh-General haz ever been arown! Yu’ll sai no finer Kitteh-General haz ever been arownd! Yo-ho-ho adn a bottlol of rum. Drink and teh debbil had done with teh rest. Down to the final port of toona men. Nobody there’s coming back again. Stay where your boots will keep dry-dirt brown.